In reaction to Keith Jenkins' introduction to his "Post Modern History Reader"
The fundamental fact faced by historians is that we were not there. Even if we were there, as in the case of historians of recent events, we could not physically experience or comprehend ALL that was going on - either from different viewpoints or within other participants' heads. So, a priori, all history is a matter of interpretation - fine, while certainly not fore-grounded in most history programs, this problem has been recognized by the more philosophically minded academic historians since at least the time of Ranke. My problem with Jenkins is that he and other post-modernists believe that this fact has been newly discovered by themselves about what they call "normal" history. This is not a new idea - Marxists knew that they were writing history from an ideological perspective, and believed that to do so was valid because all history is subjective - so did historians of the right. Objectivist or Realist history (normal to Jenkins) as it became formalized during the 19th and early 20th century was not unaware of its biases, as Jenkins recognizes in his discussion of "liberal pluralism" on pages 14 and 15 of the handout. The acceptance of other varieties of history was not on the basis of "anything goes", but on the basis adherence to academic standards of historical interpretation - i.e. documentation, factuality, etc., a fact that Jenkins also recognizes, though he interprets it as a weakness (p. 15, 2nd para.). It is this tendency to accept other methods of viewing history which is the great strength of "normal" history - it can encompass totalitarian historical views such as Marxism (and its derivative, Stalinism) or National Socialism and accept them as simply another means of interpreting the past - not THE means of interpreting the past as was attempted by the Nazis and the Soviet Union - it is here where the great danger lies - when ideological views and interpretations of history become predominant, so does intolerance and intellectual totalitarianism, often accompanied by political and social totalitarianism, at least in the 20th century. This is the danger I perceive, and I believe that many of the critics of post-modernism perceive - in that post-modernism is based on attacking the notion that any intellectual, political, artistic, literary etc. position/belief is "better," more "correct," or "fair" than another - they are all equally valid, it leaves the door open to totalitarian belief systems. If the National Socialist view of history isn't less valid than current normal history, then why shouldn't it be used to promote the well-being and prosperity of a certain group, ethnic, or otherwise depending on who you want to privilege, at the expense of the "other." Post-modernism does not provide any standard by which it can be judged, other than by the tastes and wishes of the individual - which is one of it points. The fact that post-modernism has attempted and still attempts to negate other ways of viewing the world to my mind labels it as a totalitarian ideology - the fact that there is no one over-arching post-modernist prism (radical feminism, ethno-centrism, etc.) does not mitigate the partisan education which some post-modernist historians have engaged in - I am referring to university level programs in which students are exposed to ideologically motivated teachings to the exclusion of others - something that did occur at times in "normal" history, but was not accepted ideologically as proper - the intent was to open up the mind, not to close it. In this, post-modernism, with its acceptance of overtly ideological historical interpretation is no different than the narrow, intolerant, religion-based history that is currently being taught in madrasahs in Pakistan and other parts of the Muslim world or Militia or fundamentalist Christian communities within the United States. My answer to question #1 of "Questions Provided"
I believe that Janet Murray's four characteristics of digital environments do help us to imagine an "expressive" form of digital history, particularly in relation to the characteristics of space and encyclopedic content. The "expressive" digital history will use all of the characteristics that Murray uses to define digital environments to form a unitary whole that will seem to flow naturally and yet present a different experience with each visit to the site due to richness of the resources and the number of possible navigational approaches to the material - this is not to say that the information would change as different links are chosen, but that the emphasis would change. An example would be the DoHistory website which is large enough to have several different approaches to its primary documents; whichever avenue you choose gives a different perspective on the material, either through the author's interpretation or your own, depending on where you go. This is possible due to the availability of both transcribed and original versions of the primary source materials along with tools and teaching aids with which to interpret them - something impractical, if not impossible to do in other media. It is the combination, regardless of the relative proportions of each, of the characteristics identified by Murray that enables New Media to be "expressive," it is for us now to work out the techniques to realize that potential. Lev Manovich's five principles of New Media are a little more problematic. His first four principles (numerical representation, modularity, and automation, and variability), by his description, only allow for additive digital history, as these are not unique to new media. Only in the fifth principle (cultural transcription), as he explains it, could a new "expressive" digital history be imagined. This digital history would partake of the structures and language of computer programming to interpret history in a process of "conceptual transfer" (Manovich, p. 47). I have not been able to find an illustrative example on the web. I find Manovich's schema to be unhelpful in imagining "expressive" digital history, mainly because I disagree with his preconceptions and many of the background arguments for his principles. One of Manovich's major preconceptions is the principle of need precedes innovation or invention. Thus he speaks of the absolute necessity for "media machines and computing machines" in order for modern mass societies to exist (Manovich, p 22). I believe this is a debatable topic, especially when followed up with the statement that the "ability to disseminate the same texts, images, and sounds to millions of citizens - thus assuring the same ideological beliefs- was as essential as the ability to keep track of their birth records, employment records, medical records, and police records." How did disseminating the same information to millions of people assure the same ideological beliefs? Were they automatons? It may have given them a shared set of cultural icons, but certainly did not assure belief. For that matter, why is keeping track of birth records, etc. essential for modern societies? Tax records could be argued, but many modern countries did not keep these records in a form usable by a "mass society" until very recently. I would argue that Manovich has discounted the additive effect of his Principles of New Media and altogether neglected a major effect of the computer on media of all types - speed. I suspect that Manovich has not spent a lot of time producing New Media as opposed to theoretically analyzing it. The result is his tendency overuse of analogies to film, understandable because of his background. The computer has revolutionized film editing due to the ease (relative to the pre-computer methods) and speed that film images and sound can be edited. In practical terms this means that editing techniques are much cheaper and vastly more accessible to nonprofessionals than ever before - thus we have the appearance of major hit movies not produced by the establishment in Hollywood, producing fresh ideas and pushing the bounds of Hollywood conventions for successful movies while operating on shoe-string budgets. The same is true for print media, gaming (as a field of endeavor), and, to some extent art. The opening up of these areas, access to which was traditionally restricted by issues of cost of production and highly specialized skill sets, to larger pools of potential authors and artists is, in my mind, "expressive" if only due to the resultant diversity of views and techniques made possible by computer technology. This is also true for New Media in the form of digital history. The ease of publishing on the web has encouraged huge numbers of people to produce web pages, many of them on history. This week's journal entry will consist of applying the questions which follow to two web-sites chosen from the course syllabus. Do these articles fulfill the promise of digital scholarship? Do they do anything genuinely new with new media? 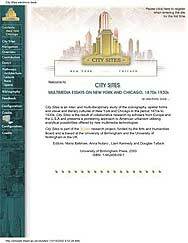 The websites in question are: City Sites and The Spanish-American War in US Media Culture. Both articles are interesting and attempt to be innovative with their use of new media for scholarly purposes. I believe that neither lives up to the promise of digital scholarship, however. In City Sites the use of Flash movies and sound add a dimension beyond that available in traditional book form, but do nothing to enhance the scholarly content of the e-book. This bit of animation probably should not have been included because it takes a significant amount of time for the Flash movie to run - this is fine for the first visit, but annoying as one navigates through the site, particularly as you are forced to revisit either the Chicago or New York opening movie each time you try to navigate out of the in-depth essays buried inside the title tags on the city maps. The essays themselves are accessible through a number of different of paths, which can be confusing, as it can be hard to tell whether or not you have already visited the section. This is somewhat mitigated by the presence of the 'Essays' link on the scroll bar, which provide a more direct way to view the essays. The interesting part of the site in terms of doing something new with new media is the possibility of exploring themes across the essays - unfortunately, this promise is not fully realized in that the four pathways lead to seperate pages for each which in turn have links to the relevant passages from a single essay, rather than a blend of the content from several essays. This is rather clunky, and serves to highlight the fact that the site is built on a fixed set of essays by different authors, with each essay divided up into modules usable elsewhere in the site. I was hoping to see an innovative use of new media through the combination of the relevant content of several essays into a new coherent whole - this would be truly new, and, I think, possible (you can certainly use databases in this way - i.e. create simple narrative text from information divided into coherent fields), though not easily. I was dissappointed in the use and development of images on this site. I was hoping to get more images and information on the actual buildings highlighted in the City Sites maps rather than the single image and short blurb actually provided for each- surely there was room for these scholars to include architectural drawings and multiple exterior views, not to mention some understanding of how the buildings were used for at least some of the buildings? 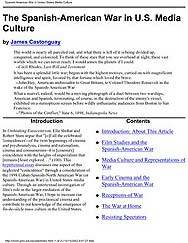 In The Spanish-American War in US Media Culture, Castonguay makes his primary resources available in the form of film clips taken from the Library of Congress archives, adding an experience not normally available to scholarly readers. The problem is that the clips take a lot of time to run, even on cable or dsl connections. In any case, while it is great to be able to view the primary resources as you read the essays, it is not a substantially new approach to new media. The article does provide a large amount of material but fails to make full use of the media to create something new - this is still a linear essay divided into multiple parts which can be variably accessed with the addded novelty of actual film clips. I was not convinced that the "multiplaction of media provided an added representational dimension to the films' various contexts" (Bass, Randy, "The Expressive Shapes of Arguments and Artifacts", AQ 51.2 (1999), p. 277.). The links in the essays take the form of digressions into particular themes, which, while interesting, tend to dilute the central message of the site as stated in Castonguay's "Introduction." Overall, I believe the City Sites e-book to have come closer to fulfilling the scholarly promise of new media, but I also believe that both sites fall well short. The City Sites project does, however, point to some interesting possibilities for new approaches to new media, not just in the combination of tools, but in the development of multiple approaches to the same data, potentially creating new insights on the topic studied.